Rhubarb is one of the first signs of spring, don’t you think? 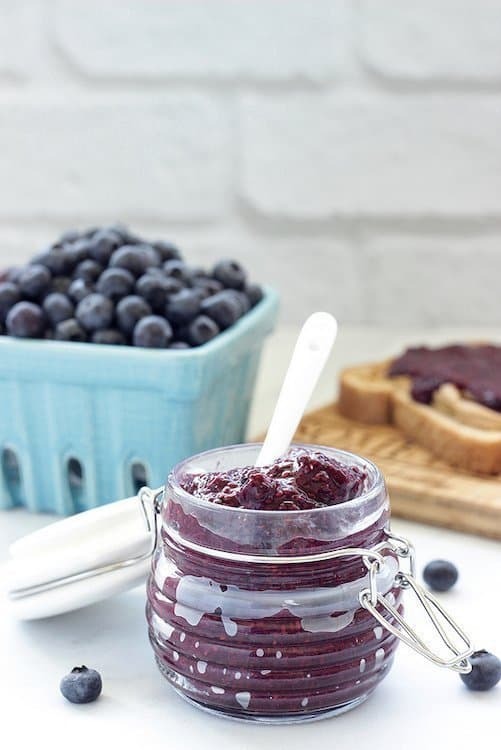 You know it’s not gonna be around for long, so when you see it, buy a bunch and make this low sugar, high fiber Blueberry Rhubarb Chia Jam. It’s just the beginning of March, so it feels a bit early, but I was at the grocery store the other day and I saw a huge pile of rhubarb! That means strawberries – and summer will be here before we know it. Did you know – although rhubarb is commonly used in desserts like strawberry rhubarb pie, it’s actually a vegetable,? Yep, and one of the lowest calorie ones at that – only 25 calories per cup. That’s because it’s very low in sugar, and pretty tart unless you sweeten it up. 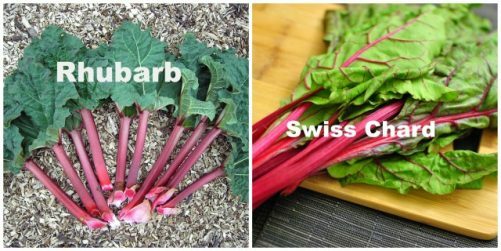 Rhubarb is also high in calcium (105 mg/cup), as well as potassium, and vitamins C, and K.
The color of rhubarb can vary from bright red to green. Most people think the red is sweeter, but its color is not an indication of flavor. It’s most important to look for stalks that are crisp and blemish free. Whatever you do, don’t be like me and mistake the bright red stalks of Swiss Chard for rhubarb! Duh. Because of its tartness, rhubarb partners well with sweet berries; otherwise, you do have to add a fair amount of sugar or sweetener to make it palatable. It just so happened that blueberries were on sale price last week, so I bought a few packs along with the rhubarb and decided to make Blueberry Rhubarb Chia Jam. 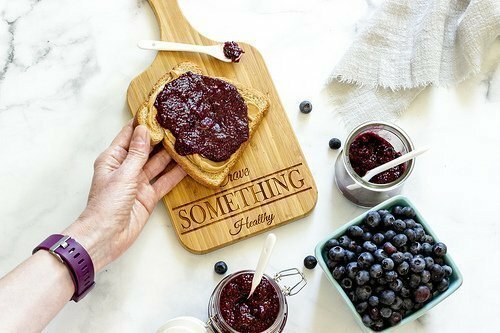 Chia seeds are seriously the best and easiest way to make jam. No worrying about whether it’s going to jell or not. And you can make your jam lower in sugar, or even use stevia or monkfruit as a sweetener. When you use regular pectin to make jam, you need a fair amount of sugar to get it to gel. Not with chia seeds! 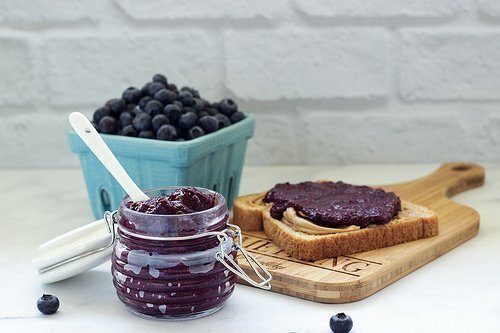 Plus, chia seeds are packed with nutrients, so they turn jam into somewhat of a superfood. Chia seeds are an excellent source of cholesterol and blood sugar lowering soluble fiber, protein, and omega-3 fats. 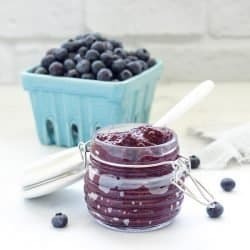 This jam is super quick and easy to make. Try it spooned into oatmeal or plain yogurt, on top of vanilla ice cream, or on whole grain bread with some nut butter or a slice of sharp cheddar. Place the rhubarb and sweetener in a saucepan along with about 1/4 to 1/2 cup of water (enough water to melt the sugar and let the rhubarb simmer). Bring the mixture to a boil, and then lower the heat to medium. Cool the rhubarb for about 15 minutes or until it’s tender and starts to fall apart. Add the orange zest and the blueberries. Return the mixture to a boil, and simmer for just about 5 more minutes, or until most of the liquid has evaporated. Turn the heat off and stir in the chia seeds. Let the jam cool. As it cools and absorbs the chia seeds, it will thicken up. Spoon jam into sterilized jars. Blubarb jam – love it! 🙂 I’m a rhubarb fan and I usually pair it with strawberries (yawn, right?). I stew them together and eat them as a pudding or topping for yogurt or ice cream. So good!